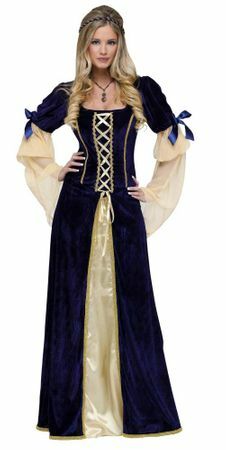 Be the fairest maiden at the Ren Faire in this adult size Renaissance Maiden costume from Fun World's Diamond Collection! Includes full length midnight blue and gold velvet dress with long sleeves, ribbon trim, and ribbon lacing on the bodice; and blue and gold twist headband. Jewelry not included.